NEGI is the exclusive distributor of Mutoh printers in India for last 19 years and has successfully installed 3000 plus printers all across India. The new UV Flatbed Printer ValueJet 1626UH - 64" printer is the most affordable UV-LED hybrid printer on the market. With an MSRP of only USD49,995, it not only gives you the ability to print on rigid substrates, but it also gives you the flexibility to print on roll media as well. Its dual function and multiple application design saves you valuable floor space and is ideal for printing packaging prototypes, POP displays, indoor signage. 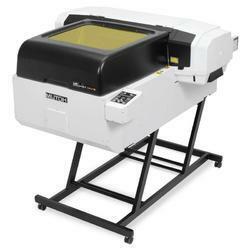 The VJ 1626UH also comes with Mutoh's VSM (ValueJet Status Monitor) app for remote printer management, and the half inch print height, faster speeds, optional SpectroVue VM-10 spectrophotometer and ability to print with white ink and varnish makes the VJ 1626UH the smart choice for any size print shop. The ValueJet VJ-1626UH will produce high-quality graphics for short viewing distances such as trade show graphics, POP, customised interior decoration, small lot packaging prototypes, banners, posters, etc. 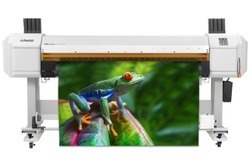 The ValueJet VJ-1638UH is Mutoh’s first ever dual head LED UV printer delivering increased print & cure performance. 162.5 cm (64”) wide, the VJ-1638UH is all about versatility; it is the ideal tool to expand your business with a wide range of commercial print applications. The printer accommodates 1625 mm (63.97”) roll media up to 30 kg as well as rigid boards up to 1625 mm x 1200 mm (63,97” x 47,24”) up to 15 mm thick and up to 15 kg. 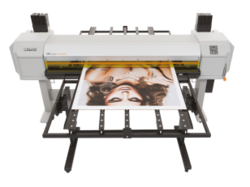 For automatic roll-up of prints, the VJ-1638UH can be equipped with a 30 kg or 100 kg motorised take-up system. Position PinsRaisable pins along side platform for quick positioning sheet material controllable by software. LED UV Lampto reduces the degree of deforming to thermal sensitive materials due to high temperature. Reliable Negative Pressure Systemtwo negative pressure tanks for colour and white separately for consistent printing quality. NegiJet UVH-3200 Hybrid printer comes equipped with the most advanced Kyocera Print Head or Ricoh Gen5 Print Head. Kyocera Head has the 3.5 PL ink droplet size and 2656 nozzles. Full-steel made, the Kyocera has a longer lifetime. The head has double-row inlet ink tubes to ensure even ink flowing pressure. The unique anti-blocking technology and the automatic bubble cleaning function highly reduce the nozzle blocking and nozzle missing during the longtime printing. Ricoh Gen5 Head has the 7 PL ink droplet size and 1280 nozzles. The Head has Single pass 600dpi High Resolution Print for 1 colour, Achieves excellent Grayscale rendering, Highly Robust and anti Corrosion Properties. Mutoh’s ValueJet 426UF 19″ tabletop, UV-LED, printer is the perfect fit for any print shop looking to expand its applications and enter the world of UV printing. Print limitless promotional items including: pens, phone cases, golf balls, awards and much more. 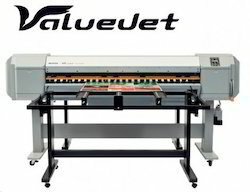 The ValueJet 1638UR roll to roll printer provides real production based UV-LED performance at an affordable price.It’s staggered dual print head design provides fast print speeds and the dual UV lamps, on both sides of the print heads,provide exceptional cure times allowing for higher production speeds. The CMYK plus white and varnish ink options areideal for printing backlit, custom wall covering, POP displays and beautiful signage. Flexible UV-LED instant dry inks,no VOC’s and fast print speeds make the ValueJet 1638UR by Mutoh the smart choice for any print shop.